I've tried to look online to update it, but have not been able to find a simple way to fix this. (I could also just be dumb and have went past a fix) - But I was wondering if someone could help me get to said version, or newer. 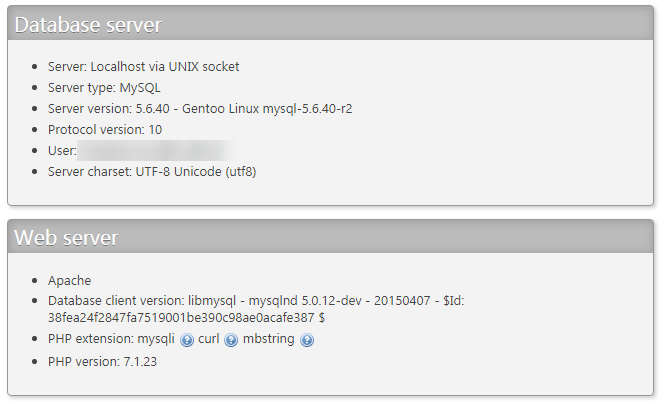 The output you posted shows that MySQL is at version 5.6.40 on your host, so it meets their requirement. They separately list a "Database client version" (of mysqlnd) that is at only 5.0.12-dev, but that isn't actually linked to the MySQL version -- it is the version number for that separate piece of software (5.0.12-dev is just the version of mysqlnd included with PHP 7.1.23). My guess would be that the installer you're using is getting confused by 5.6.40 and thinks that it's less than 5.6.5 because it is not designed to properly handle a 2-digit number for the last value -- 5.6.4 would be less than 5.6.5, and 5.6.4.0 would be less than 5.6.5.0, but 5.6.40 is actually higher than 5.6.5. If you're running an old version of the installer, you should try a newer one. Otherwise, this is something that you'd have to contact the developer about. In general, I wouldn't recommend using paid forum software. There are many mature open-source forum packages available, including phpBB and SMF. The main reasons that you might consider a paid software are if you need one-on-one support or need specific features that aren't included in free packages. In your case, you should definitely take advantage of that support you are paying for and contact them .